The snow continues to focus attention on those things that might have gone unnoticed. In this case, it appeared that there were little flags projecting from the snow. Could these be tribal banners marking a tiny pixie encampment? At closer range, there appears to be a stalk that thickens near the end and then quickly narrows to a point. They look something like the antennae of a skipper. Maybe I’ve found the wintering grounds of the rare Polar Skipper. No, it’s not animal. This is definitely a plant part. I’ll bet at least one of you has figured out what this is. Probably someone who recently had a couple of days intensive training on the subject. 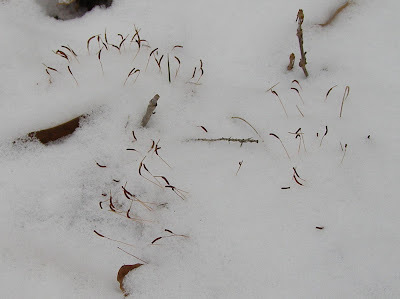 Remove a little snow and we find the clump of moss to which these stalks belong. There’s nothing strange or exotic here at all. It’s just spore capsules from a moss plant. The snow gives a background that makes it easy to see some rarely noticed details. 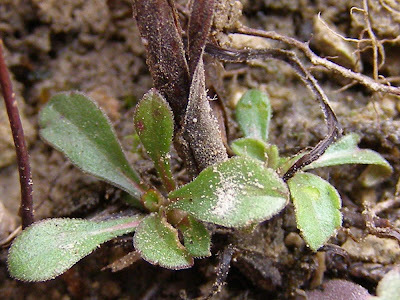 It becomes harder to see the stalks and capsules as more of the moss is exposed. 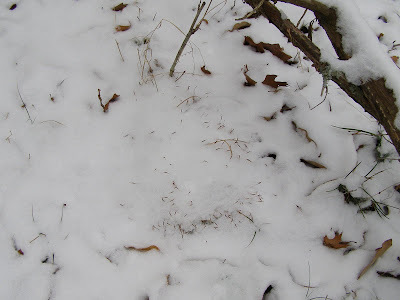 When the snow melts, this will all blend into the background of the forest floor. Managers of native ecosystems must be able to identify the components of the landscape and the role they play in the complex system. A manager without this knowledge is like a coach who doesn’t know the names or capabilities of the players on his team. When I walk, I like to call up the names of the plants I’m seeing. If you do this often enough, the identification comes naturally as you scan the landscape. It’s like looking out at a crowd and having all the names of the friends you see come automatically into your mind. To gain that kind of familiarity with plants, you first have to learn some special identifying characteristics, so you can readily identify what you are looking at. This is more difficult during the winter, but there are many features that are readily observable. One of my favorites is the catkin, a type of long, pendulous flower cluster. There are only a few woody plants that produce catkins, so seeing this one item has instantly narrowed your choice of plants. In this case the catkin belongs to the Hazelnut, Corylus americana. Once you can identify a species, you need to spend time with it until you construct a mental image that means to you just one specific type of plant. We do this with people all the time. At a glance, most people can identify someone they’ve just met in passing, like a store clerk or customer or annoying guy from the basketball game. They may not be able to give any descriptive detail, but they have that mental image that allows them to make a positive ID. My mental image tells me this is a clump of Hazelnut. Buds are a good thing to key in on. This is a rather distinctive bud of the Blackhaw, Virburnum prunifolium. Determining it to be a Viburnum is fairly easy. I can only call it to species because I’ve examined it through leaf, flower, fruit and winter. When I see thick, tangled and pointy, I automatically think Viburnum. The instant recognition brought on by a mental image is good, but following that, you still need to know some basic characteristics in order to confirm your first impression. The image is just a good tool for quickly narrowing your choices. Spines make tood identifiers. Your most likely choices when a bud is flanked by a pair of thorns are Black Locust or Prickly-ash. Remember that the Prickly-ash has the rusty bud and you’ve arrived at your identification. The Prickly-ash shrubs are fairly openly branched and the branches always remind me of something with a slightly arthritic bend. Again we have some distinctive buds. These are destined to form the early spring blooms of the Fragrant Sumac. Fragrant Sumac seems to be a shrub trying to be a vine. Branches will fall to a horizontal position and often root where they touch the soil. Looking inside the tangle of branches reveals the larger horizontal stems. Plant identification can be difficult, but if you take the time to really get to know the plants you see regularly, the whole process will become easier. Remember that is supposed to be an enjoyable activity. You don’t often see streams, under natural conditions, make a 90 degree turn. This section of creek comes in from the right, makes a sharp angled turn and then flows away. In the process, water builds up in the turn and forms a concentration of swirling water. A well proportioned circular pool results. Recent events have worked to intensify the forces at work in the pool. A fallen tree, combined with debris carried from an upstream neighbor during a flood event, has formed a low dam across the channel. During runoff events, water built up behind the dam accelerates as it comes over the top. This extra energy and turbulence allows the water to scour loose material from the stream bed. The result is a couple hundred feet of clean stone bottom. The dam catches floating debris and halts the progress of large particles moving along the stream bed. This accumulation strengthens the dam, but forms a long section of stream with a sand or mud bottom. This is a common occurrence that increases the diversity of stream habitats. A new tree has fallen across the dam. When it falls to the weight of decomposition, it will add its mass to the structure of the dam. The newly fallen tree didn’t even have the courtesy to break. It looks as though the trunk suddenly became limber and let the tree recline without cracking. This is why the creek has no choice but to turn. A limestone base overlain by thick shale will stop any flow of water. Besides the barrier of rock, there is quite a water flow that follows the twin gullies and cascades over the exposed shale. This flow helps to accelerate the water circulation in the pool. This area has been remarkably stable over the past 20 years. 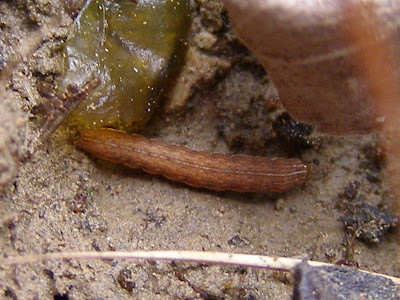 The curved tree trunks are indicators of earlier soil slippage. When the trees were young, sliding soil caused them to lean down hill. The soil then stabilized and the trees were able to redirect their growth upward. The hillside is still very fragile and a change to the stream channel below the shale outcropping could cause the soil to slip once again. Understanding the historical events that brought a site to its current condition is essential to predicting the future results of your current management activities. Dramatic changes in the weather can result in dramatic creations. Pictured is a natural phenomenon known commonly as Needle Ice. 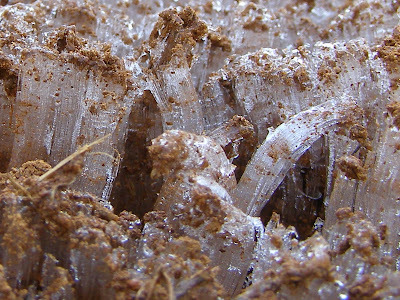 Needle Ice forms when subsurface water emerges from the ground and is acted upon by below freezing air temperatures. The recent rain saturated the surface soil and moved a short distance below ground to exit on the neighboring hill slopes. As it emerged, it began to freeze. 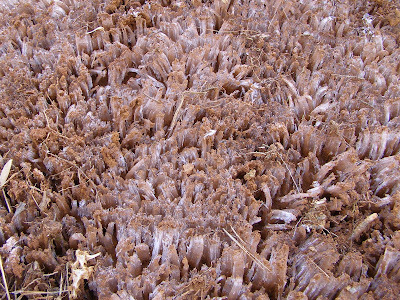 The large ice structures are composed of many individual ice fibers. 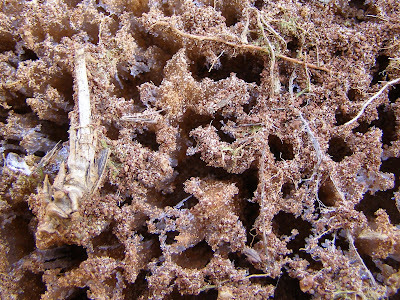 A fiber typically begins as an ice crystal forming in association with soil particles. 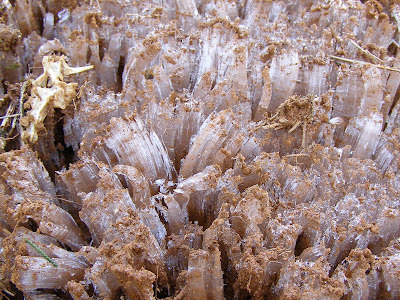 As the water changes to ice, the volume increases and newly formed crystals push the previous crystals away from the soil. Water continues to feed into the base of the filament and the process increases the filament length. The largest of these filaments was about 2 inches tall. This is where the water surfaced. Ice formation continued off into the grass, but the crystals were most easily viewed on this bare spot. Soil particles that spawned ice crystals were carried upward with the ice as the column grew. This process could certainly be disruptive to any plants trying to colonize the bare ground. Formation of Needle Ice is like an exaggerated example of frost heave. The area between the standing ice columns offers easy access to the soil below. 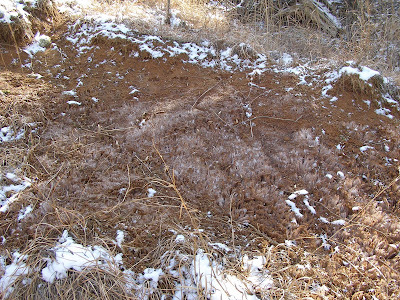 When the ice begins to melt, the tops disintegrate first and the freed soil falls into the fissures. Seeds that began on the soil surface are dropped into a fissure to be covered by the falling soil. In this way, the seeds are planted. We had a good rain Sunday night and I’m sure the salamanders headed for the pond, but I failed to see them. Part of the watershed for the pond is the township road and mud from the road leaves the pond water clouded for a couple of days. I did find some amphibian action in the water garden. Things warmed up enough to get this Green Frog up and moving. The recent snow probably caused him to head back under cover. Green Frog tadpoles take a year to ready themselves for transformation into an adult frog. Trying to hide beneath the leaf is something a little more salamanderish. This is the Red-Spotted Newt, the terror of the aquatic world. Adult newts are primarily aquatic and will stay in the water year round. They have an insatiable appetite and will eat any animal they can get their mouth around. I’ve seen them eat snails, worms, insects, tadpoles and watched one work its way along a string of toad eggs. I’m constantly removing newts from the water garden, because when they become abundant, there’s nothing else left. This is a male. The tail of the male in breeding condition develops more of a fin on the top and bottom and the fin ridge continues part way up the back. The hind legs of the male are also much enlarged. During the mating embrace, the male uses its hind legs grab the female just behind the head. These dark pads on the legs and toes are an aid to gripping the slippery female. The Gray Goldenrod, Solidago nemoralis, is another of those plants that is actively growing on the prairie. This is a short growing species that tends to behave itself if you invite it into your flower borders. It’s an attractive species that I always stop and notice and I found a lot going on with the plant this winter. At first glance, I thought this plant was still shedding ripe seeds. It turns out that these seeds never fully developed and there’s nothing left but a shriveled seed coat holding the fluffy pappus filaments. It makes the plant quite noticeable in the brown grass. This plant consisted solely of basal leaves last year, but will probably send up a flower stalk this year. 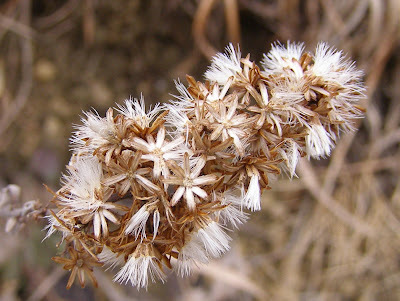 Gray Goldenrod sends out short rhizomes that produce new plants quite near the parent. Two new plants are growing from the base of the old flower stalk. There’s not always enough energy left after the plant flowers, to support this type of basal growth. The plant normally continues its vegetative expansion by way of new growth from the rhizomes. Perhaps the energy that should have gone into developing seeds is now being used by these new sprouts. Not only are the plants actively growing on the prairie, the insects are out to eat them. I found this larva feeding on the sprouts at the base of the old seed stalk. It was active enough to run when I disturbed it. 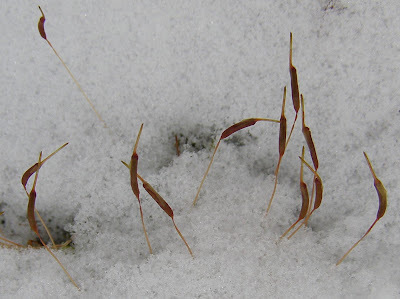 It really bothers me when I hear the winter prairies described as sleeping or dormant or dead. 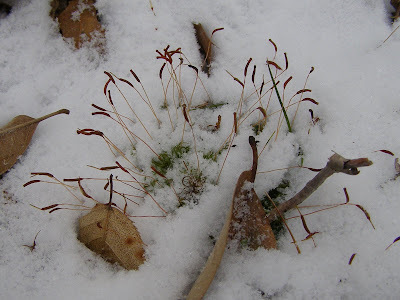 I admit that the volume of growing plant life is greatly reduced in winter, but there are plants that grow and some that even thrive in the winter season. A few, like this biennial Rose Pink, I talked about in December. This plant doesn’t seem to have been hurt or inhibited by the snow and cold we just experienced. 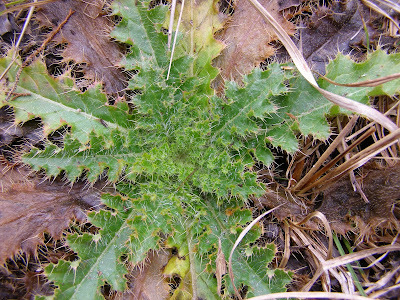 Some yellowing on the leaf margins isn’t slowing this Pasture Thistle. It’s ready to take advantage of any sunlight that becomes available. 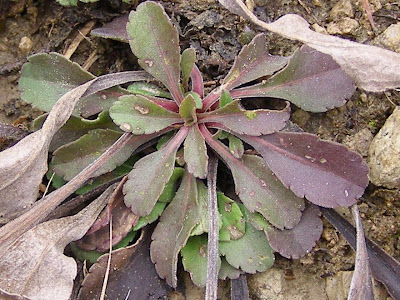 Winter annuals wouldn’t survive without the cold, wet winter season. They're in a rush to put down a root system and develop enough leaves to produce energy for storage, so they can flower and produce seed before the conditions get too hot and dry for survival. These Draba reptans are less than two tenths of an inch across and won’t get much bigger before they flower. They’re normally found in the barren areas where they are not shaded by other plants. 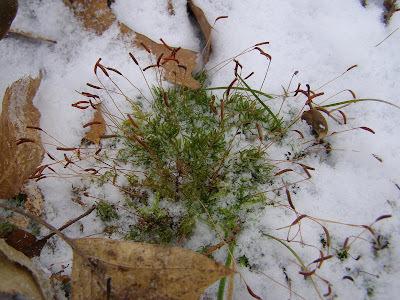 Here are two more winter annuals common to the barrens. 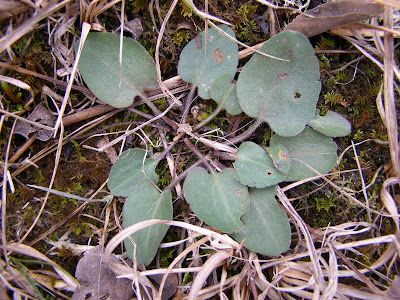 In the center, with the lobed leaves, is Leavenworthia uniflora which normally produces a rosette of leaves about an inch and a half across. 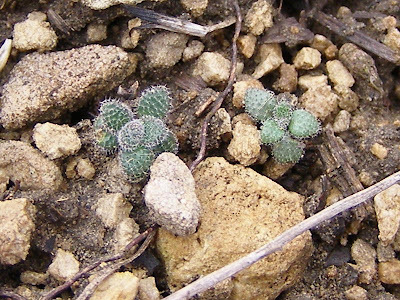 Draba cuneifolia, seen in the lower left, is normally about three times the size of Draba reptans. 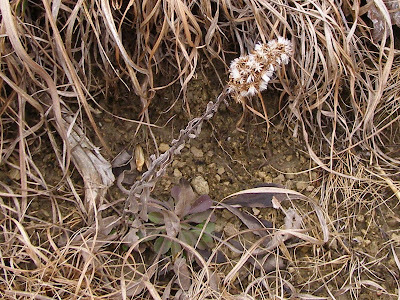 One of the hazards these plants face is being pulled from the ground by frost heave as the soil anternately freezes and thaws. An amazingly long root system helps these little plants stay in place. I once saw a flowering Draba cuneifolia laying on its side at the end of fourteen inches of exposed root. The tiny Fringed Houstonia is a perennial that takes advantage of the winter sunlight to begin storing the energy needed for flower production. Being a perennial, it has a more developed root system that helps to prevent frost heave. 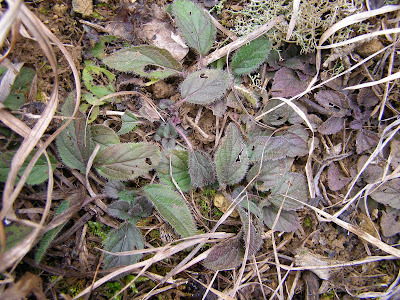 Basal leaves of the Downy Wood Mint. This is an early June bloomer, but you can find actively growing basal leaves at any time of the year. This is an aster, but I’m not sure of the species. I need to work on becoming more of an all season botanist. 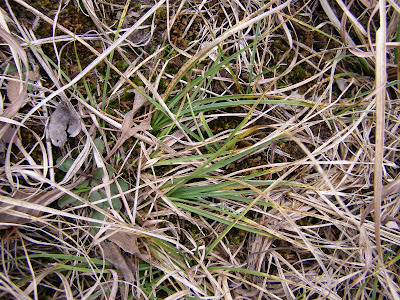 This is Juniper Sedge, Carex juniperorum. It will flower in late spring and pretty much disappear by late summer. The clusters of leaves tend to grow horizontally from the root mass and give the plant the appearance of having been stepped on. Don’t assume there’s nothing growing just because all you see it brown. Keep your joints flexible by crouching down and taking a closer look. You never know what you’ll find by brushing back that layer of dead leaves. During the winter, I enjoy seeing things that are hidden by the leaves of summer. One impressive sight is the thorn encrusted trunk of the Honey Locust, Gleditsia triacanthos. Here is a trio of Honey Locust trunks that all sprouted from the same cut stump. The thornless tree grouped with them is a Black Walnut. This is a tree that really doesn’t want to be hugged. I would guess that a bird nest in the boughs of a Honey Locust would be safe from ground based predators. I can’t imagine anything climbing that thorny trunk. The degree of thorniness varies between trees. Some are practically thornless, while others are fully covered. This looks like what Prince Charming had to hack his way through to get to Sleeping Beauty. 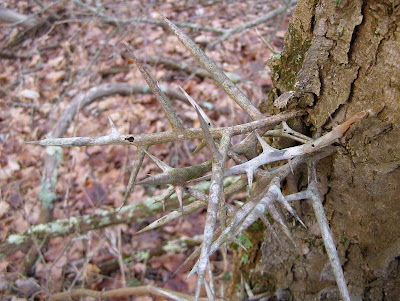 The thorns are very sharp and are often stout enough to penetrate a tire or a hiker’s footwear. 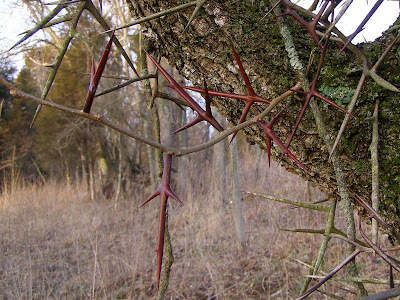 Years ago I read an article in an outdoors magazine detailing how to remove a Honey Locust thorn from your hand. There was a lot of detail about killing the pain, keeping the wound clean and using different tools for the extraction, but it never did say why you couldn’t just grab the thorn and pull it out. A lot of the older thorns have holes that look like they may have been made by something exiting the thorn. I wonder if there might be a borer or some other insect that develops inside the thorn and emerges at maturity. It would really be neat if it was something like an ant that maintained a colony inside the thorn. I may have to open a few thorns this summer and see if I can find out what’s going on. The newer thorns look to be some kind of modern sculpture. The sharp points are in clear evidence, but the bright color and shiny appearance make the thorns much less menacing.